Thank you for coming to attend the 2016 RSE Conference. Before you arrive in Manchester you must install VirtualBox onto your laptop. 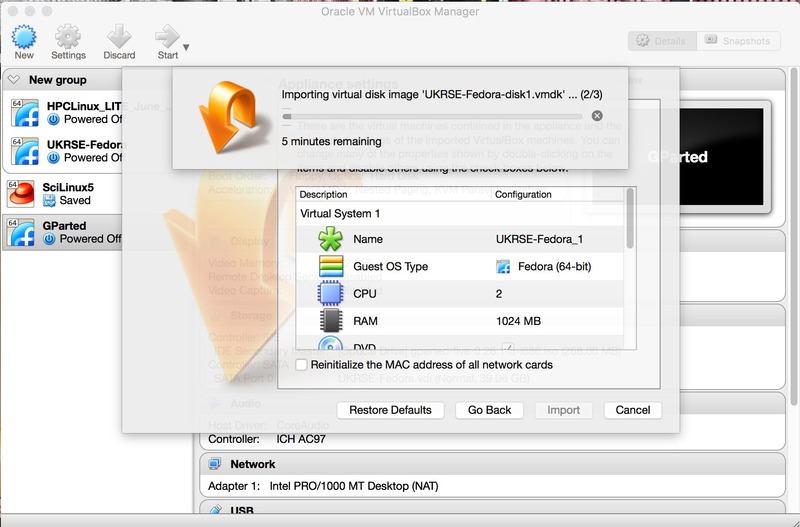 You can download VirtualBox from here, with installation instructions available on this page. 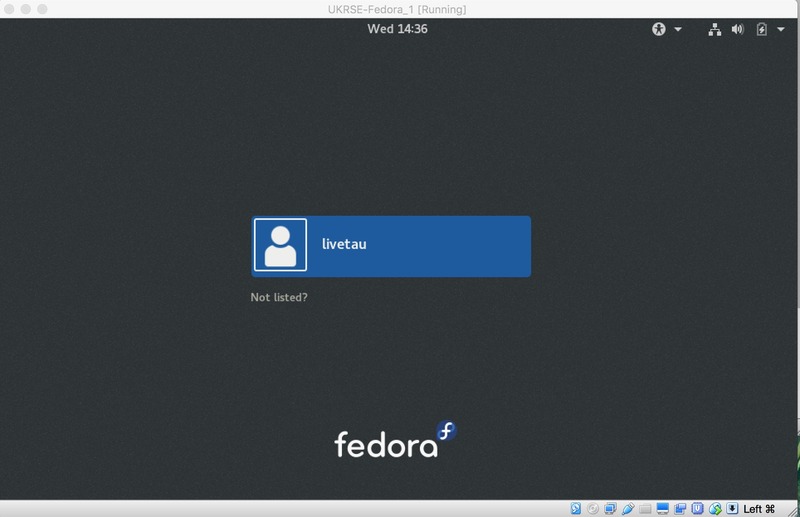 The workshops will run inside a custom Fedora Linux Virtual Machine Image within VirtualBox. This will be supplied to you at Manchester on a USB drive. Please make sure that you install this image before starting the first workshop (instructions below on how to do this). Feel free to ask any member of the conference committee, or the conference volunteers over lunch on Thursday, if you need any help. If you want to install the Virtual Machine Image before coming to Manchester, you can download it from here. Beware, as it is pretty big (13 GB) and may take a long time to download. If you are interested, the full contents of the USB drive are available here. On the USB drive you will find a file called UKRSE-Fedora.ova. 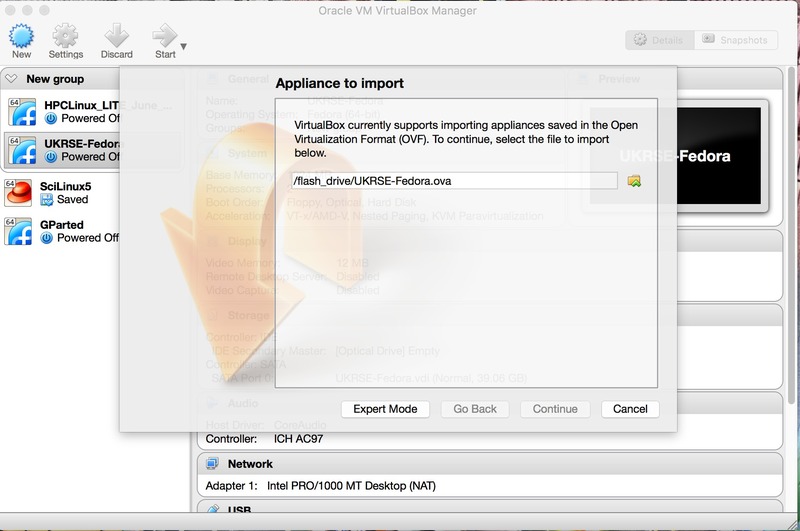 To install the image, start VirtualBox, and then select File | Import Appliance. Use the file dialog to choose the UKRSE-Fedora.ova file from the USB drive. Click “Continue” to select this file. Next, click Import to import the image. This will take some time, and will take up 25 GB on your disk. 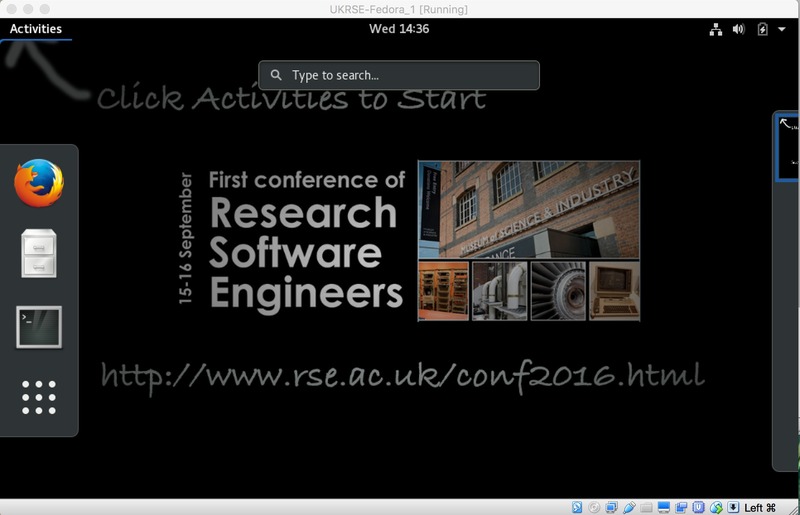 Once the image has imported, you can start the virtual machine by clicking on the UKRSE-Fedora button that will appear on the left of the display. This will boot into a Fedora Linux desktop. To log in, click on the username livetau and type in the password livetau (both the username and password are livetau). This will log you into the Fedora desktop. Click on the Activities button on the top left to find the icons to start a web browser (Firefox), a terminal or a web browser. All of the workshop material is in the directory /home/livetau/workshops.